When breeding season comes, (the wet season between May and June) the female Dwarf Crocodile builds her nest to lay eggs. She make her nest near the water so the nest is always wet. When she breeds, she lay up to 20eggs (and at least 10 eggs), after which she has 85-105 incubation days. 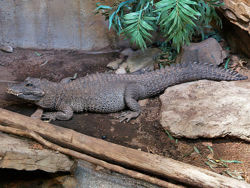 During this time, the female Dwarf Crocodile protects her nest and the eggs. She always watches her eggs until the eggs hatch. 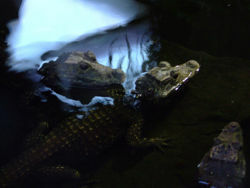 Some young Dwarf Crocodiles that are hatched from eggs go straight to the water, to live on their own, while some stay with their mother Dwarf Crocodile for 2-3 weeks. Some young Dwarf Crocodiles go to live by themselves; they are eaten by other animals like birds, fish, mammals, and reptiles. The young Dwarf Crocodile has a different skin color than adult and juvenile Dwarf Crocodiles. Their backs have a black color and red or yellow cross bands as well as yellow spots on their body. Dward crocodile mutliple author. wikipedia. Osteolaemus tetraspis Unknown author. Crocodilians Natural History & Conservation. West African dwarf crocodile Unknown author. Bristolzoo. Dwarf CrocodileJoseph Phillips a.k.a. WhoZoo. African Dwarf Crocodileunknow author. TheBigzoo. This page was last modified on 2 September 2014, at 21:29.